SPRING, TX (KTRK) -- One person is dead and authorities are looking for two men in a pickup truck after a hit-and-run accident on the North Freeway near Rayford Saturday morning. Law enforcement officers are looking for two men driving an elevated four-wheel drive pickup truck who they say hit a family's vehicle around 7:00am. The Department of Public Safety tells Eyewitness News the accident involved a couple who were driving with their sons from Oklahoma to the Texas Medical Center so mother could be treated for an ailment. The family was coming from Oklahoma to the Texas Medical Center because the mother was sick. 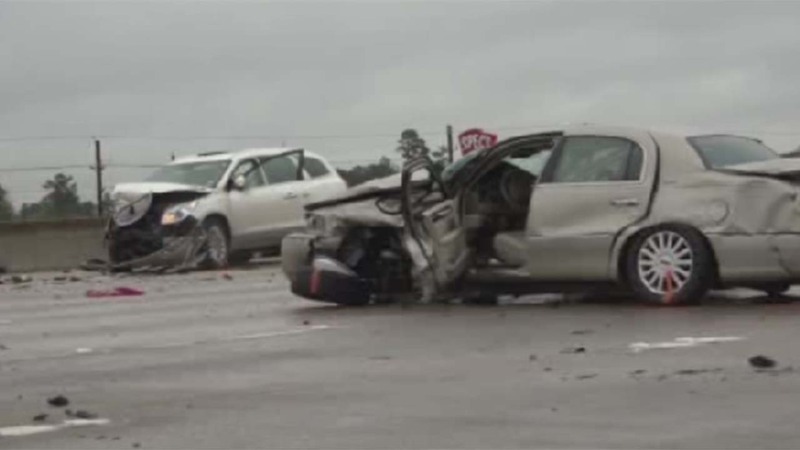 We've learned the two sons were in a lead vehicle on the North Freeway, with both parents following in a separate car. That's when authorities say a pickup truck hit the parents' vehicle. DPS tells us the pickup truck driver apparently pulled over and got out of the vehicle to look at the wreck, and then got back into the pickup, and sped off. DPS says an off-duty Houston county sheriff's deputy, driving over the hill where the accident happened, hit the parents' vehicle. The deputy suffered minor injuries in the crash. Almost at the same time, a man in the military noticed the wreck and saw the woman badly injured and began CPR. She died at the scene. We've learned the parents names are 51-year-old Habib Almishkhas and 46-year-old Sawsan Almilad. The mother died at the scene while the father was taken to the hospital with non-life threatening injuries. A short time after the crash, the couple's sons realized their parents were no longer behind them and turned around on I-45 to find their parents. They came upon the accident, pulled over and ran across the freeway to get to the wreck. They stayed at the scene to answer investigators' questions. If you have any information on the two men suspected in this crash or their vehicle, contact police.